Elfhelp's Entertainment Director Benjamin is in the USA for Christmas 2008. Unfortunately we can not take any more Santa/Carols or Elf Entertainment bookings this year - instead we are focusing on our top quality Christmas Trees and Christmas Installations. Note: But by all means email your interest for 2008 and we'll put you in our database to contact next year! Elf Entertainment - from Santa to Carols! Real Elves to decorate your Christmas Tree! An extra service which we can do by special request is have our Elves dressed up in traditional Elf suits telling Christmas stories to your children while they decorate your Christmas Tree! 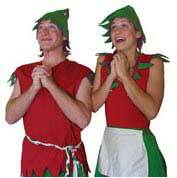 These Elves are trained actors who have had extensive experience performing educational plays for school children around Australia.